Magic Ganji (Gruel) - Together We Live - Class 5/Teaching Learning Processes need to excite the children and ensure 100% participation of the children/Writing a recipe is one of the discourses that can serve two purposes - tell the story (Together We Live) and make the child understand the process of writing a recipe/preparation of magic Ganji prepared by Gopanna in the story to befriend the townsmen of Shantinagar who were unfriendly/Discourse-Oriented-Pedagogy /Telangana Schools/Telugu Medium Children. Here we are providing a video on -How to make the students write a Recipe on preparation of Magic Gangi from the lesson Together We Live of Class 5th, by Mrs Ramani SRG. 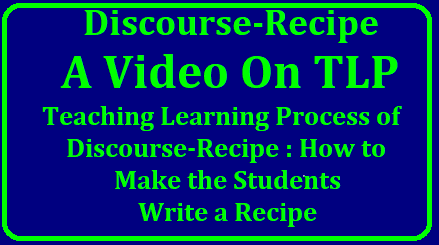 As the Primary Teachers at the ground level are facing many difficulties to transact discourses like Recipe, here this video will make us to know very clearly on how to transact this discourse Recipe. We all teachers are very much thankful to Mrs Ramani for providing such a wonderful video which will give a clear idea on the steps involved on how to make the students write recipe on their own. This lesson plan will help Students learn how to write a recipe. Students will practice writing in logical order and using appropriate vocabulary through a hands-on model experience. Objective: Students will be able to determine the sequence or order of a recipe by breaking apart a recipe that has no steps and rewriting the recipe with steps. Do-Now: On a note card make a recipe card and write down one of your favorite recipes, make sure you list the ingredients, supplies, steps, and cook time. Connection: What is the importance of following a recipe directly? What do you think would happen if we didn’t follow a recipe in the order things were suppose to go? It is really important that when you follow recipes you a really figure out what order things should be happening and you follow that order. Procedure/Steps: The order things should be made. Pictures/Diagrams: may be included so you can have a visual of processes you might have to do or what your end product should look like.